The Vatican has again summoned the head of a controversial schismatic sect in a bid to bring about reconciliation with the Church. The Society of Saint Pius X (SSPX), which is thought to have hundreds of adherents in Ireland, rejects many of the key teachings and reforms of the Second Vatican Council (1962-65). Although Pope Benedict nullified the excommunication of the four bishops in the movement in January 2009, bishops and priests of St Pius X still live in a state of canonical irregularity. According to a report by the respected Italian Vatican-watcher Andrea Tornielli, Bishop Bernard Fellay, superior general of the SSPX, will meet with Vatican officials on September 14 to discuss doctrinal issues. The group -- founded by the Frenchman Archbishop Marcel Lefebvre -- believe that, in some places, Vatican II represents a rupture with the Church's tradition. 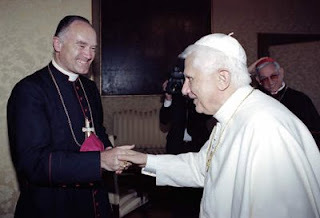 According to Mr Tornielli, the Vatican is expected to present Bishop Fellay with a memorandum of understanding clarifying some of the teachings of Vatican II in the hope that the SSPX will be able to end their schism and re-enter the Church. The proposal, which has been studied by the Vatican, would allow Lefebvrists the establishment of an ordinariate similar to that offered by the Pope to Anglicans who wanted to come into communion with Rome. The SSPX provoked controversy in 2009 when Pope Benedict lifted the excommunications and it emerged one of the bishops involved, Englishman Richard Williamson, had earlier given an interview in which he denied the extent and scale of the Holocaust of European Jews. The Pope had not been informed of Bishop Williamson's views before the decision to lift the excommunication was announced. The SSPX in Ireland is headquartered in Dun Laoghaire and has regular Masses in Dublin, Cork, Belfast, Athlone, Newry, Tralee and Cashel.